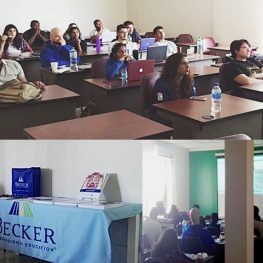 Becker Health Care held a presentation in association with IAU College of Medicine for the USMLE STEP 1 Exam on Friday October 27th. Becker assists students in identifying areas of strength & opportunities for growth by providing exam-relevant, integrated content taught by our experienced IAU faculty using our most up-to-date curriculum materials and resources in preparation for the USMLE Step 1 Exam. They also give special discounts to IAU students, such as the special 2-week promotion that ended on Nov 10th Additionally, the event included helpful information provided by Mr. Chong on the visa procurement process for students who need visas to enter the United States, as well as a fun raffle draw for all the attendees.